Each year the Ringly Brothers Barnum & Bailey Circus usually comes to Columbus in mid May with a tradition that goes back almost 40 years of having some of the circus' star performers, their elephants, parade down Goodale Blvd from Grandview Heights. 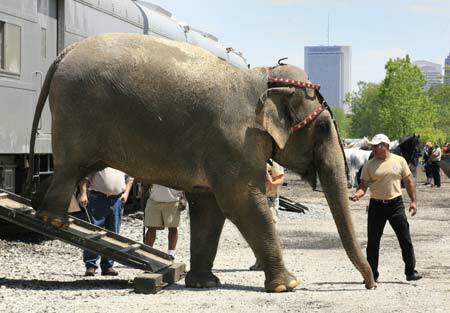 Besides this annual event, Columbus actually has a much deeper relationship with the circus. Marble Cliff was the winter home for the internationally known Sells Brothers Enormous United Shows, which started here in 1871 by Allen, Ephraim, Lewis and Peter Sells. The Sells family arrived in central Ohio years before Ohio was a state. Coming from Pennsylvania, two Sells brothers arrived in 1801 on the shores of the Scioto River near what would later become Dublin. After securing land then sent word back to Pennsylvania for the rest of their family to follow. A number of years later, a son of one of the brothers moved from Dublin for a more urban life in Columbus. The son, Peter, married and had five sons. After the Civil War (one son died in a prisoner of war camp), 3 of his sons after having been involved in several businesses decided to purchase the services of several live performers they had become acquainted with. Over the years the troupe of performers grew and expanded. At its peak the show included a 328' big top, 6 other large tents, 322 workers, 64 performers, 50 cages of wild animals, 13 elephants, and 7 camels. It was the age of big tops and big shows. In 1872 P.T. 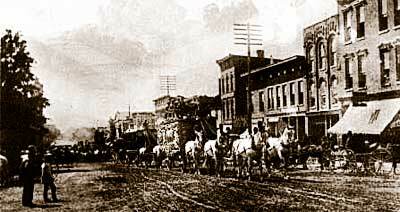 Barnum began transporting his museum across the country. Several years later, the five Ringly Brothers put together a show in 1884. During the same year, Colonel William F. "Buffalo Bill" Cody started his famous American Wild West Show. 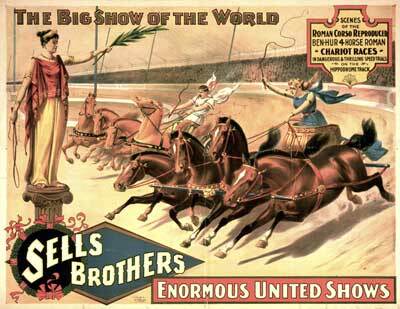 It was the Sells Brothers show that was one of the major forerunners of the big top. Each year, the Sells Brothers circus came back to its hometown for the winter months where they stayed on 1000 acres of land west of the Olentangy River between what is now Fifth and King Avenues. At the time, this was part of Marble Cliff. The area was known as Sellsville. During the warmer months when the majority of the organization were on the road, Sellsville saw a large influx of gypsies that took over a forested area along the town. Peter Sells actually built his home across the river in what is now known as Victorian Village on the corner of Goodale Park. 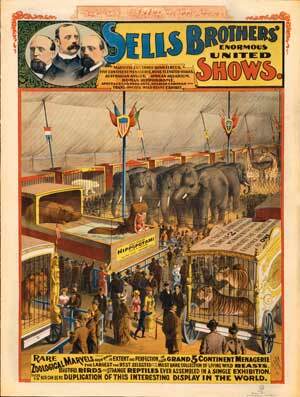 Peter Sells' private life became a 3-ring circus in 1900. The 32 year old Peter, married 18 year old Mary Luker of Missouri in 1878, just a few years after the brothers began their traveling circus show. Although she knew her husband was involved with the circus, she wasn't really enamored with circus life. After their wedding the couple moved to Columbus where the big show's headquarters were located. Their daughter Florence was born in the late 1880s. Over the next several years the family lived in several homes in the downtown area. In 1895, Peter Sells hired famed architect, Frank Packard to build an exception home that would claim public attention for the local circus king. However, even the Sells' new home across from Goodale Park was not enough to soothe a troubled marriage. William "Billy" Bott (left) and his brother Joseph created their first billiard parlor in 1898 that included an elaborate front entry. In 1905 they moved their establishment to the Larrimer building on North High Street. During this move, they also took the elaborate front entry they had built with them. 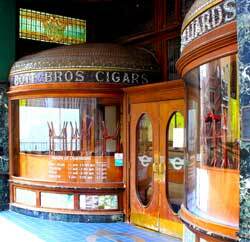 At the new location besides the billiard tables, they also offered drinks and meals, and sold cigars. In later years, the restaurant was renamed, although it retained much of its original splendor. The new name was the Clock Restaurant. Today that restaurant is now home to the Elevator Brewery & Draught Haus. In 1899, after hiring detectives to investigate his wife's activities, Peter Sells moved out of the new mansion and filed for divorce. During the much publicized trial it became known that her affairs may have been going on for as long as 16 years. Tabloid-like stories told the tale of Mary's affairs with Billy Bott, another one of Columbus' businessmen and socialites. 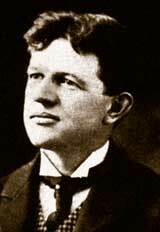 Another lover may have been one of Sells own associates, Harry Lyons. A circus, ballrooms, wine and cards, and the wealthy Mrs. Sells, of Columbus, Ohio, seeks the company of other men in the absence of her husband. A divorce suit follows, and Miss Florence Sells was placed upon the witness stand to tell of her mother's unwomanly conduct. When a woman is a devil she is the whole thing. After the divorce, Peter Sells remained in the house on Dennison for just 2 more years. 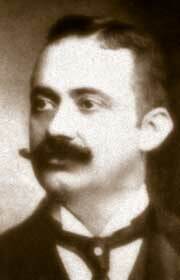 Peter died in 1905 and in that same year his older brother also died. With no one left to run the show, it was sold to James Bailey in 1905 and when James Bailey died the following year, the Ringly brothers bought the entire circus. For the next six or seven years, the Sells Brothers circus continued operating under that name. The Columbus headquarters were closed in 1910 and the Sells Brothers name eventually faded away and the circus became just another part of the Ringling Brothers, Barnum and Bailey's Greatest Show on Earth. 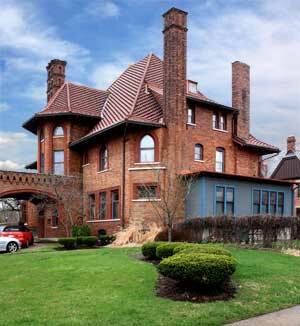 Located across from Goodale Park on its westnorth corner, the former Sells Manion still is a striking residence. Although the actually spent very little time living in the actual mansion on Dennison Avenue, the structure has enjoyed a fascinating life. The structure is somewhat similar to Moorish architecture and seems out of place for the rest of the Victorian homes in the area. After Sells sold the house it was occupied by various families and organizations. From 1963 to 1996, the main house was a nursery school. In 1997 the entire house was returned to its residential status and remains in private hands. One of the really big features of the Sells Brothers Enormous United Shows were their elephants. At the time, most circuses transported their elephants by wagon, but the Sells Brothers wanted their star attractions to only go first class, so they constructed a number of specially designed railroad cars that could transport their giant beasts from one town to another. The demanding circus and personal problems in the family led to a gradual transfer of ownership of their three ring circus. In the late 1890s, James Bailey purchased part of Sells Brothers circus In 1906 the entire circus was transferred to the Ringly Brothers, which would ultimately become the circus we know today: Ringly Brothers, Barnum and Bailey's Greatest Show on Earth. Ringly Brothers Barnum and Bailey continues the tradition by off-loading their show stars in Grandview and leading the parade down Goodale Ave. to Nationwide Arena. 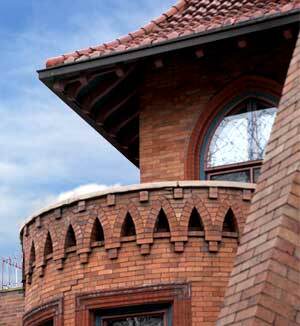 Frank Lucius Packard was an Ohio architect that created a number of notable buildings still in existence today. He was born in Delaware in 1866. He designed the Huntington Chapel at Green Lawn Cemetery, Warren G. Hardings famous "front porch", and the Old Governor's Mansion on East Broad St. in Columbus. Packard also was involved in a number of Ohio's county courthouses including Harrison, Wood, Wyandot, and Putnam. He also designed North High School in Columbus, and Westerville High School which is now Emerson Magnet on N. Vine St..
All told, Packard designed over 3400 buildings during his career with over 100 business and residential buildings just in Columbus.